Custom Go Green Ecological Calendars Personalized in Bulk. Very Inexpensive, Promotional. Lowest prices in USA and Canada. "Early Bird" Special! 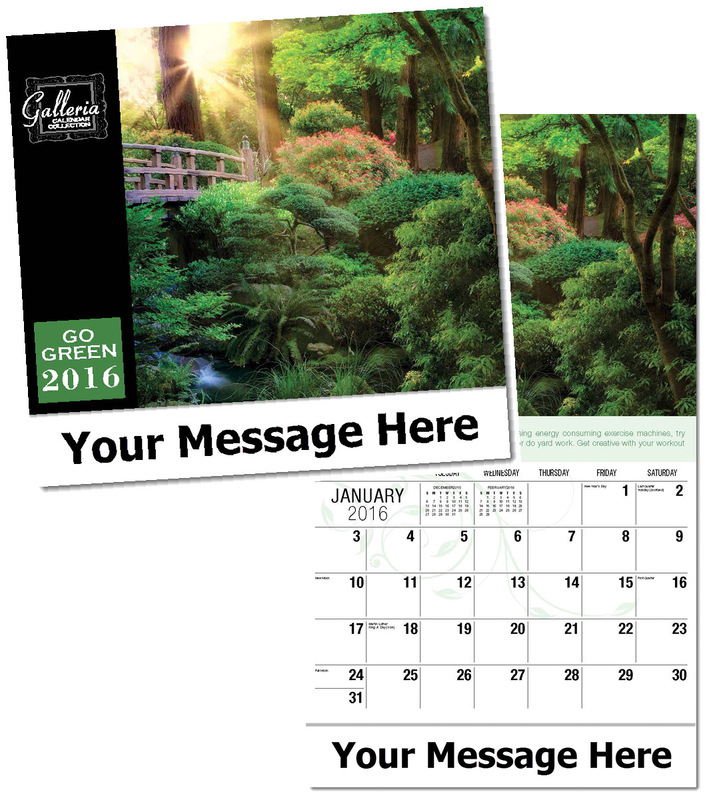 Bulk discount Go Green calendars, personalized with your custom imprint . Lowest price in USA and Canada for wholesale promotional Go Gree calendars. This new eco-friendly title features 13 beautiful pictures of life on earth, each with a green theme. Images are accompanied by monthly tips on simple actions we can take to protect our precious environment. Our high quality, low cost personalized Green calendars include both American and Canadian holidays. See our "Early Bird" deep discounts on our Price Table below. American clients pay no taxes. Free artwork design and free proofs!